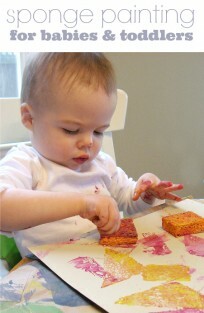 I love how this turned out, but don’t be fooled this isn’t really a toddler craft. Even though my son had fun , I did most the work for this one. 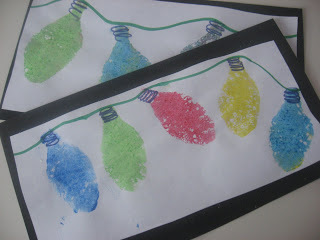 Older children could do this with little to no instruction but toddlers will need one on one help for the painting to look like lights, they can also just have fun with the sponges , or both! Gather your materials. 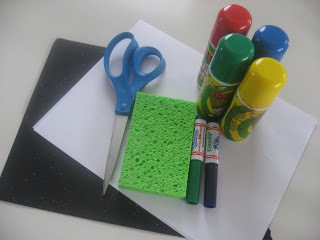 You will need a kitchen sponge, washable markers, scissors, some plain white paper, some bright thin paint, tape and black construction paper. 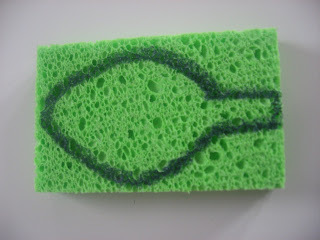 Start by drawing a light bulb shape on the sponge. Cut out, then wash the marker off. 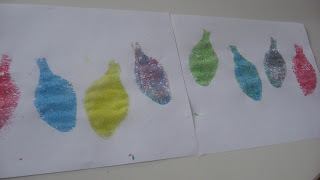 We used the paint rollers for our paint, but you could use any paint or even an ink pad. Essentially you are stamping the sponge. Stamp! 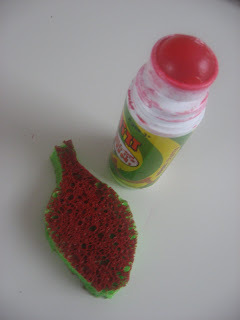 If like me you have been house bound due to weather and are a little crazy and want to try this with a toddler here are my tips… Ask your child where they want the sponge, then place it there, then have them slap the sponge and FREEZE. My son loved this , he loved freezing and it helped get nice prints for the effect. 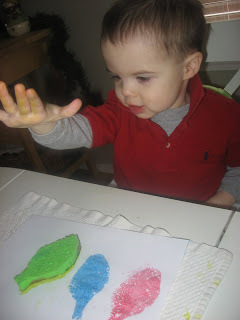 We managed to have fun with these tricks, he also directed which color to use. After he rolled the roller on his head I took over those duties too. Do another color…and repeat. I blotted my sponge between uses but I didn’t bother washing it. 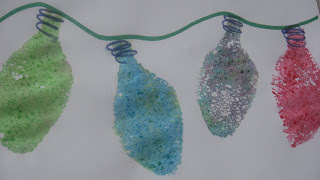 Let the bulbs dry. 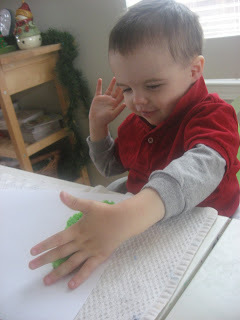 Here is where I gave my son the sponge and roller and let him be free! While I finished up . 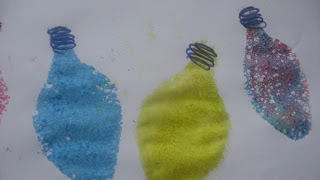 Add squiggly circles at the neck of each bulb. Trim and tape to a black piece of paper. I am using tape because plain white paper is thin and glue could ruin the prints. Previous Post: Brr It’s Chilly !! so cool! the best part is, of course, your son’s attempt at body painting!too cute! Darling lights! And I love the site design. Looking good! What a cute project. I’m going to have to file that one away for next year. 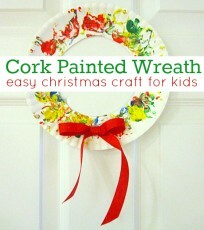 I love this idea, but my little boy is a maniac and I don’t know if I should be doing this craft with him. He is 2 years old and unlike any other 2 year old I have ever met. He is so crazy, but telling him that Santa Claus won’t give him gifts if he isn’t a good boy has really helped. 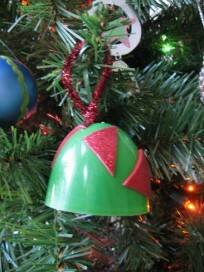 I think he would love it, but I want him to get the idea of lights. I’m torn between fun or lights that look like lights. What do you think? Ashlyn- definitely go for fun! 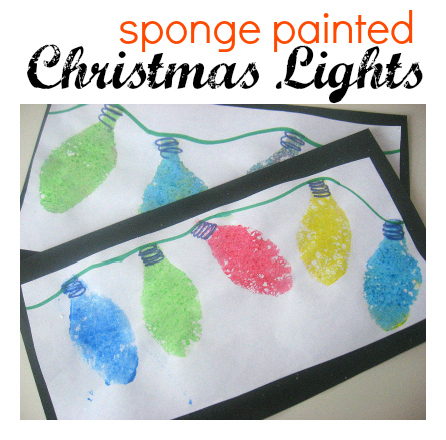 Don’t worry about it looking like lights, let him explore the sponges, colors and have fun! !